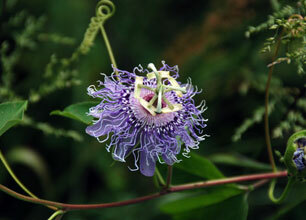 Also Called: Passion-flower, purple passion-flower, apricot vine. Stems: Vine, trailing or climbing, glabrous or usually finely soft-hairy. Leaves: Alternate, simple, 1.6 to 6 inches long, 2.8 to 6 inches wide, deeply palmately 3-lobed 3/4 to 4/5 of length, 3-nerved; lobes broad, tips pointed; margins finely toothed; upper surface green; lower surface pubescent to slightly waxy; stalks .8 to 3.2 inches long with 2 conspicuous glands above middle or near apex. Inflorescences: Solitary flowers on long stalks in leaf axils. Flowers: Regular, 2 to 3 inches across; stalk to 4 inches long; bracts 3, leaf-like, spatulate to oblong, 1/6 to 1/4 inch long, blunt or pointed; each bract with 2 conspicuous glands; sepals 5, petal-like, lance-oblong, .8 to 1.4 inch long, tip with short awn, greenish, lavender or white, drying bluish, alternating with petals; petals 5, lavender or white, about same length as sepals; sepals and petals arise from saucer-shaped receptacle (hypanthium); numerous filament segments also arise from hypanthium in several series; outer filaments long, thread-like, purple or pink or rarely white, serve as nectar-guides; inner filaments short, hair-like, serve as rain-guards; stamens 5, inserted in center of hypanthium, drooping; style branches and sigmas 3. Fruits: Berry, egg-shaped to nearly spherical, to 2 inches long, about hen's egg size, orange-yellow when ripe; seeds egg-shaped to nearly heart-shaped, 1/6 to 1/5 inch long, reddish-brown, pitted, somewhat flattened. Habitat: Moist, open woods, old fields, roadside ditch banks, thickets, fencerows, stream bottoms, open disturbed sites, rocky slopes. Distribution: Southeast quarter and Wyandotte County. Uses: The fleshy fruits are edible and were cultivated by Native Americans. In the late 1800s, an extract of the plant was used to treat insomnia, epilepsy, and to soothe nerves. The dried flowers were used in preparations to treat burns, skin disorders, and hemorrhoids. Native Americans used the plant to induce vomiting and to treat swellings or sore eyes. Native Americans gave a tea made from the roots to babies to help wean them and dropped the warm liquid in the ear to treat earaches. Comments: From Latin passio "suffering", an allusion to the sufferings of Christ. Named in 1593 by the Spanish physician Nicholas Monardes. The common name "may-pop" comes from the sound made when the hollow yellow fruit is stepped on. Folklore says the flower structure symbolizes the suffering of Christ. The thread-like filaments allude to his rent garments or the crown of thorns; the 3 styles the 3 nails; the 5 anthers the 5 wounds; the pistil the sponge filled with vinegar; the tips of the calyx segments the crown of thorns; the 3-lobed leaves the spear; and the 3 bracts the Trinity. The size and color of the flowers attract insect pollinators from considerable distances. The flower fragrance resembles carnations.